These are the latest in Japanese squid fishing technology. They are made with translucent bodies and have tiny batteries and an LED inside with two zinc terminals poking through the sides of the body. The sea water acts as a conductor or a switch to turn the LED on. You can activate the LED by holding the terminals between your thumb and forefinger (as in the picture below). However if you do this too often you will drastically shorten the life of the battery as your body forms greater resistance than salt water. 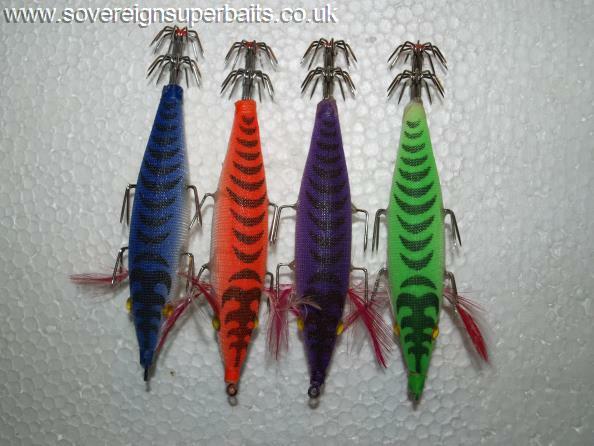 These are great to have in the tackle box for a bit of late dusk or night time squid fishing. Obviously there is no need to charge them from a torch like the luminous model above. : These squid jigs are single row large hooks, designed for cuttlefish & large squid primarily, but will still take the smaller ones. : You have all seen these being used on Rex Hunts program with great success and with the ever warmer summers and milder winters we are seeing greater numbers of squid in our own waters and the current unofficial British record from the shore stands at 5lb 4ozs. We have experimented with all sorts of different designs over the past couple of years but have found these two patterns to be the best, primarily because they have either larger gape hooks or double rows of hooks which are barbless allowing for quick unhooking. They are all cloth covered which gives greater adhesion for the squid. They are supposed to represent shrimps or prawns which are the staple food of the species of squid we get in the North Atlantic. The keeled model especially responds very well to casting from a spinning rod in falling light conditions and also to be used in deeper water on a gilling outfit. 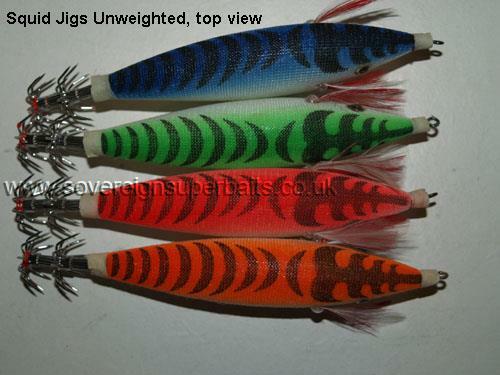 The unweighted / unkeeled model is generally used in strings of three and worked in a similar fashion to mackerel feathers but less violently, more of a sweeping action than the savage jigging action when using feathers. 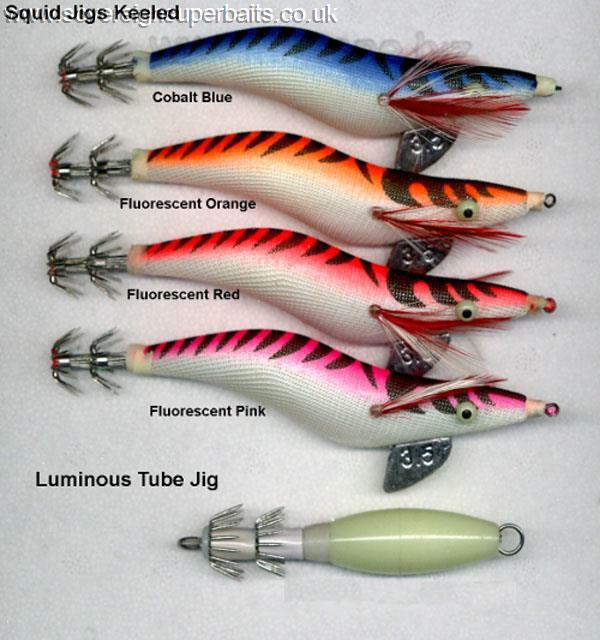 Luminous Tube Jig: These are great for fishing after dark. You charge them from a torch and a 30 second charge from a reasonable powerful torch will give you around 5 minutes fishing time (fishing time will vary from 10 to 15 times the charge time depending on the power of the torch). : These unweighted squid jigs are most often used in strings of three or more like mackerel feather, but moved far more gently, more of a sweeping action. They can also be suspended under a float & the waves left to do the work, a system favored by the kids in Portugal & used to very great effect. They are billed as 10cm but are more like 11.5cm, come with two rows of needle sharp stainless steel hook. 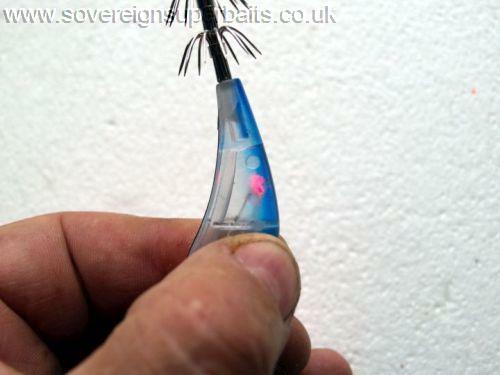 Like all squid jigs the hooks are barbless, making unhooking a breeze. They weigh 12.5gms & come in the four colours pictured. YO-ZURI A815 Squid Jigs "SPANGLES"
: These "Spangles" are long out of production, but we have secured a supply of them for you squid enthusiasts. These used to produce squid in abundance down in the Mediterranean a couple of decades ago & then simply vanished in favour of the newer style "shrimp" shaped squid jigs. These were nick-named "spangles" by UK anglers obviously because of their resemblance to the old fashioned sweet that came in big 6lb jars back when I was a lad. They weigh a mere 8gms 1/4oz & are a full 20.5cm/8" long, they are made of translucent plastic with holographic foil running through them. 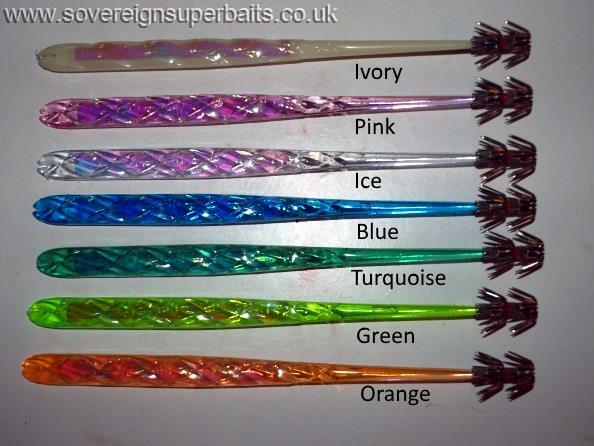 They were original made for industrial use & intended to be used in strings of ten with about 1.3m between each of them, with a light at the top of the string giving you a 15m string on a huge hand line, But found favour with rod anglers as they were so productive. They were then faded out long before YO-ZURI gained favour in the UK & couldn't be sourced because no one knew what they were actually called, plus the reps were only interested in selling what was easy to sell (less work, easier money). We dropped on these purely by chance in October 2017 & bought the lot. 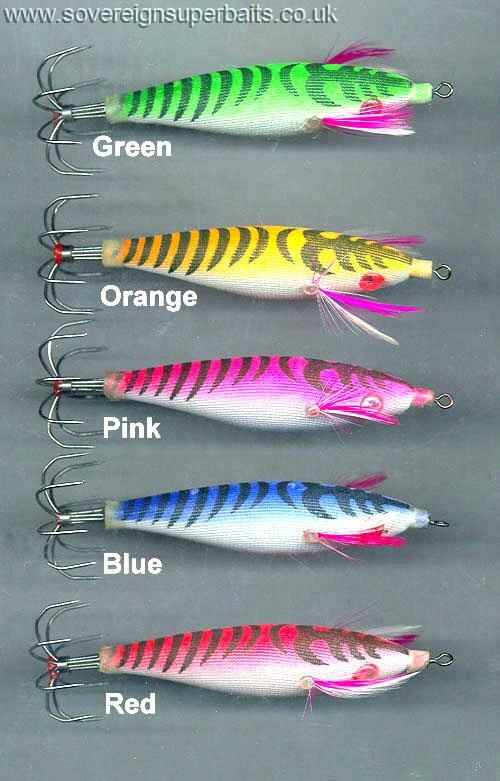 : These are the infamous little DIKI DIKI jigs & they have a long pedigree & have accounted for millions of squid over the years. 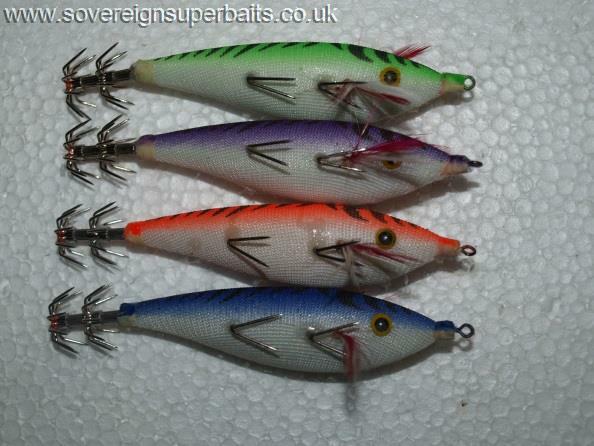 They have four extra hooking points on each lure & are internally weighted so sink horizontally, which is more natural. All regular "squid fishermen" have those takes that feel like a concrete block has landed on the end, only to fall off again ! This is when a squid/cuttlefish grabs the lure from the side only to get spooked by the feel & "propels" itself away at high speed without coming in to contact with the tail hooks. This is because the squid have two extra long feeding tentacles with "clubs" on the end which they use to grab their prey & drag it to their mouth. 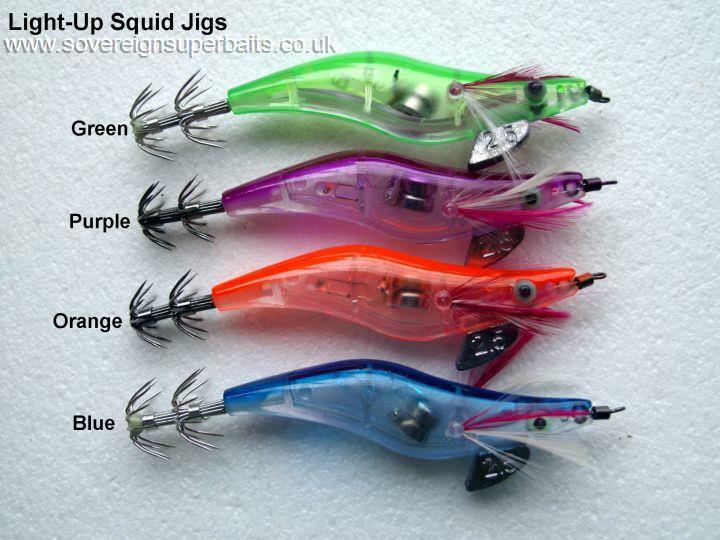 It is all to easy for the squid to retract these extra long tentacles & escape, but when using these "Side Hook" jigs, these missed bites are diminished by over 90%, in fact my personal experience has been a 100% hook up rate on our stretch of the Sussex coast line. 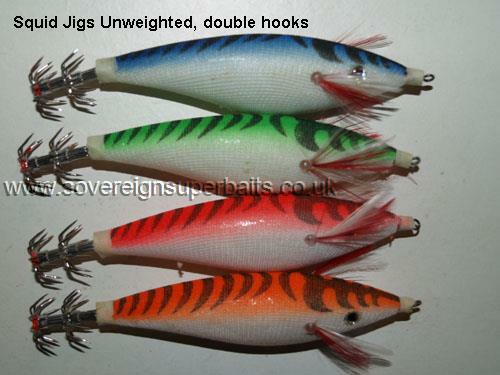 These jigs weigh around 14gm/1/2oz & sink at around 15cm/6" per second if used on their own on a light spinning outfit, the way most kayak anglers use them. They are 11.5cm L.O.A. with a 9cm body & they come in the four colors shown.